© 2019 Fernwell Associates, Inc.
An affordable option for a downtown "office." • Starts at $65 per month. 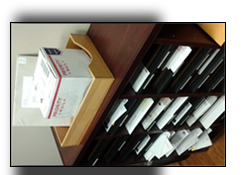 plus postage costs is charged if a client prefers a once per week mail-out option. Monthly rate increases slightly if more frequent mail-outs are requested. • One hour/month complimentary conference room usage. Additional use is charged at $20/hr. • Complimentary coffee/tea service is provided for both you and your visiting clients. • Access to copier/scanner/fax equipment, if needed (per page charges apply). Why pay for physical office space if you don't need it?